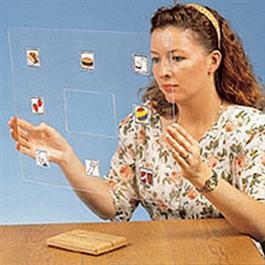 This transparent acrylic board fits in a sturdy wooden stand to make a convenient eye-gaze board. The nonspeaker looks at a picture to convey a message. The communication partner, who sits on the opposite side of the board, follows the client's gaze to interpret the message. The transparent Standard Overlay can have pictures attached and be changed quickly. This is a practical tool for developing initial direct selection skills. Complete Kit includes: 15 x 19 inch acrylic board with wood base and instructions.